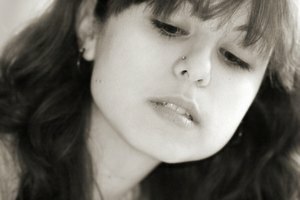 A labret stud is a piercing in the lower lip. The jewelry can be removed and changed after six to eight weeks when the piercing has healed, but the inner tissue of the piercing remains soft and delicate for up to a year. If you remove your starter stud too soon, there is a possibility that you may not be able to put it back in. A newly pierced lip will close up within minutes once the stud is removed, and even established piercings can close within 24 hours without a stud to keep the piercing open. Rinse your mouth thoroughly with the saline solution, paying particular attention to the pierced area. The Association of Professional Piercers recommends this type of cleansing solution for oral piercings because strong mouthwashes can irritate the mouth lining around a piercing. Wash your hands with the antibacterial soap and dry them with the paper towels. Clean the area around the labret stud on your face, taking care to remove any residue on the labret bar or under the stud next to your skin. Dry your face with the paper towels. Put on the latex gloves and stand or sit in front of the mirror with the towel positioned so that it can catch the stud if you accidentally drop it. Dry the area around the labret stud inside and out and check that it moves freely when turned. Hold the flat disc on the back of the labret stud with one hand or use your teeth to keep it steady. Grip the outside part of the stud with your other hand and unscrew it counterclockwise until the ball comes off. Remove the piercing by gently pulling the disc up and out of your mouth. If there is any resistance or pain or you cannot remove the bar easily, replace the ball and seek advice from your piercer or doctor immediately. Latex gloves are not essential, but they keep germs to a minimum and help you to grip the labret stud making removal easier. Wash everything thoroughly to lessen the risk of infection and clean the labret stud every day if you replace it. 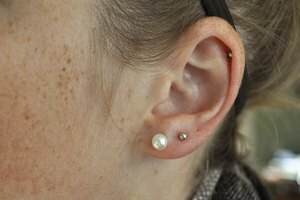 Piercings are very prone to infection unless strict personal hygiene is observed at all times. If your labret does not turn freely or you cannot move it, see your piercing professional for advice. They will be able to remove the stud safely for you. Alex Burgess has been a professional writer since 1990, specializing in travel, herpetology, lifestyle, fashion, health and fitness. Her work has appeared in various British newspapers, magazines and international online publications. Burgess studied design before working as a journalist in England.